Everyone is on a budget these days. Department budgets are reviewed often and we must account for each and every dollar. Even household budgets are under a microscope. Here are a few tips to save money on your flag investment. Watch the weather. Take flags down on days with high wind, rain or icy conditions. It is best to not expose your flag to rain or snow. Check out the flag surroundings.Is the flag close to any rough surfaces, tree branches, brick, gutters, cables, wires or other solid surface?Taking the step to make sure your flag cannot get caught up or rub up against an item will prolong the life of your flag. Mend flag.Inspect the fly end of the flag for signs of tattering. Are threads broken? Trim the threads reinforce the seams. Has the fly-end tattered?Cut the flag and re-hem the flag.Watch the length of the flag. Fold a USA flag at the end of the blue star field. The red stripes need to extend past the blue star field. State and logo flags can be repaired until the tattering reaches the logo, emblem or seal of the flag. Purchase flags in bulk. We offer deep discounts when purchasing USA and Custom flags in bulk. The discount is dependent on the number flags purchased. 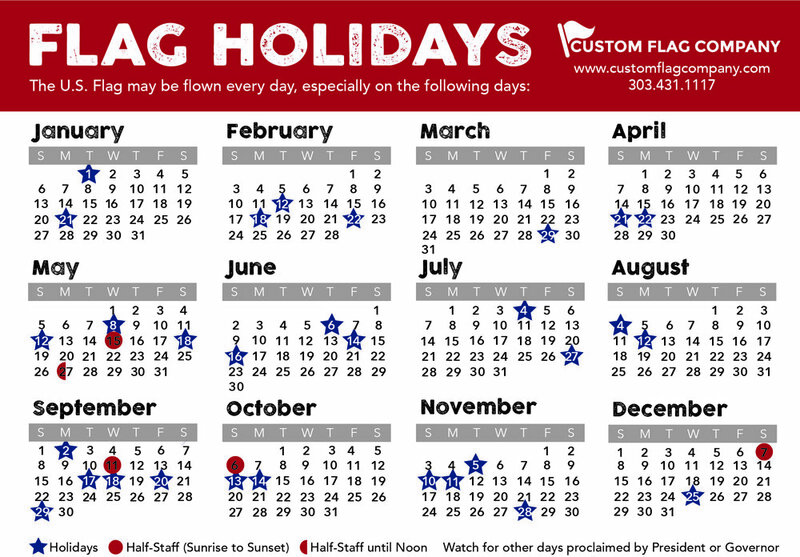 Posted on March 31, 2014 by Kim Griebling and filed under Custom Flag Company News, Flag Facts, US Flag and tagged Save money US Flags.